We’re constantly scouring the Internet looking for articles related to family finances and teaching kids good personal finance habits. 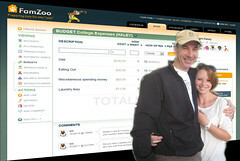 You can visit the FamZoo delicious page to see our ever growing list of family finance bookmarks. We’re up to 1355 now! Each week, we pick our favorite articles from the previous week and post them here. April is officially National Financial Literacy Month, so this week’s picks and bonus media focus on financial literacy themes — some traditional, some not so. Let’s kick it off with a traditional financial literacy theme: budgeting. Your child’s transition to college is a critical time to get serious about budgeting. For most kids, it’s the first time they’ve spent a sustained amount of time outside your home. They quickly discover how many heretofore “hidden” expenses you’ve been picking up on their behalf, not to mention some hefty new expenses that come along with the college territory. A formal budget — Have your child put together a formal budget proposal for their expenses during the school year. Review it together and make sure it’s written down (either on paper or, better yet, online where you can all easily get to it for reference). A formal reimbursement process — agree upon a formal process for your child to follow when making the inevitable reimbursements for unanticipated expenses. It should be more involved than a 1am phone call or text. The process doesn’t have to be complicated, but it should require your child to formally record their requests so they can be reviewed later. I actually like the idea of it being somewhat inconvenient for your child — friction in this case is a good thing. Review and revise the budget — periodically review the budget and the reimbursement requests outside the budget. Tweak the budget and/or behavior as necessary to account for changes outside their control (rising gas prices) and changes within their control (too many sodas from the dorm vending machine). Emily’s article gives excellent examples of the unexpected expenses you and your college bound teen can expect. Read it here. A somewhat overlooked financial literacy theme is entrepreneurship. I stumbled upon this inspiring lesson on how the entrepreneurial spirit and microfinance can fuel the cycle of economic growth. I love the story, and it’s based on a real-life experience. The high quality EconEdLink site is primarily intended for K-12 teachers and their students, but there’s no reason why parents can’t adapt the material for home use. Check out the One Hen lesson and others here. And finally, an even more commonly overlooked theme of financial literacy is philanthropy. Tom steers parents who’d like to introduce their kids to philanthropy in the same direction I do: DonorsChoose.org. Read why Tom does here and why I have since 2006 here. If you’ve got preschoolers, check out the new Sesame Street “First Steps to Spending, Sharing, and Saving” video content that was released on the web this month. It’s truly wonderful to see financial literacy themes delivered by Elmo and the other classic Sesame street characters who are so familiar to (and beloved by) kids (and parents) everywhere. Check it out here. Jayne, thanks for the links. I've seen Cameron's talk - very thought provoking (and some controversial bits) - definitely a good one to watch and discuss with teens! I wanted to take the opportunity to thank you for the work you're doing in supporting financial literacy education. Your blog and site are a great resource. You made my day! I really appreciate the compliment and the encouragement - particularly given your impressive professional background in finance and financial literacy initiatives. Comments like yours really stoke the fire to keep plugging away at our mission of helping parents teach their kids good financial and charitable habits.